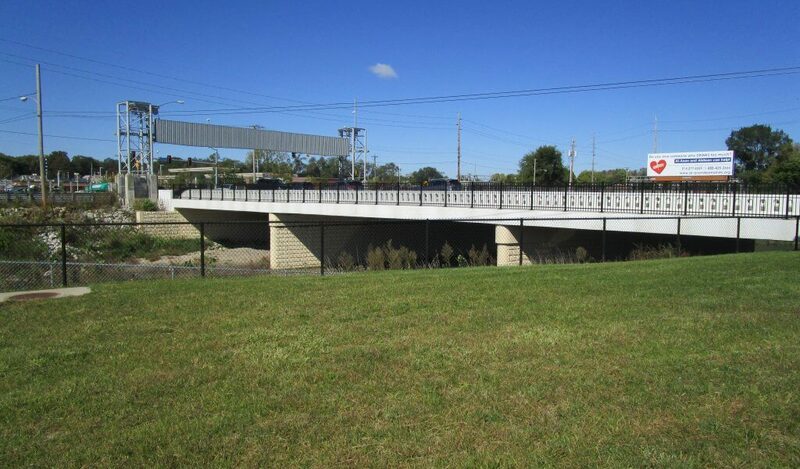 This project involved replacing a 3-span concrete arch bridge with a 169-foot long, 3-span continuous reinforced concrete slab bridge with five traffic lanes and sidewalks on each side. 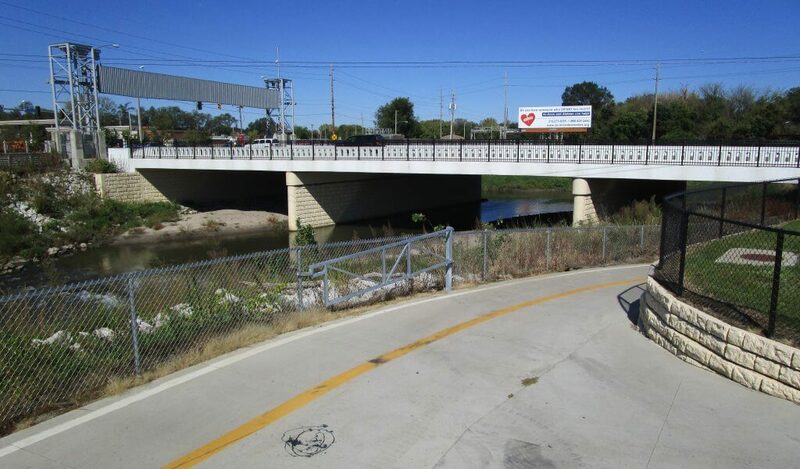 The bridge is located on the west edge of Des Moines on Grand Avenue near SW 63rd Street, which is the dividing line between Des Moines and West Des Moines. In addition to replacing this aging and deteriorating bridge, project goals included improving bridge hydraulics by making the waterway opening bigger and adding travel lanes and sidewalks. The bridge is located on a busy street that carries cars, trucks, pedestrians, and bicyclists. Approximately 30 percent of the vehicles that use this bridge are trucks. This project stirred a large amount of public interest throughout planning, design, and construction. Bridge design had to be tailored to the site to accomplish the increase in waterway opening, added travel lanes, and pedestrian/bicycle access. The design of this project started in 2010 with final plans for letting turned in in December of 2011. Construction was to take place in 2012, but utility conflicts/relocations delayed the project a year, so construction took place in 2013. The bridge opened to traffic in December of 2013, and the project was substantially complete in 2014. A floodgate on the west end of the bridge near SW 63rd street constricted the width of the bridge. Sidewalk widths and bridge roadway width was optimized to provide the maximum number of travel and turn lanes as well as sidewalk space for foot/bicycle traffic. Numerous public meetings were held to obtain project input from the City Council, City Engineering Staff, and citizens. The length of the bridge was constrained by the existing concrete levee wall and floodgate on the west end of the bridge near SW 63rd Street and a private roadway on the south side of Grand Avenue east of the bridge. The bridge is located within the limits of a detailed FEMA Flood Insurance Study and the riverside of a U.S. Army Corps of Engineers (USACE) levee, which makes the hydraulic design requirements more stringent. Detailed hydraulic modeling was performed to ensure flood protection levels upstream of the bridge were not affected. Shuck-Britson and Snyder & Associates worked closely with the Iowa DNR and the USACE to ensure compliance with all regulatory requirements. The bridge is supported on high abutments and pile bent piers. High abutments were necessary to create a larger waterway opening for the bridge. Walnut Creek frequently floods, and the previous bridge overtopped fairly often, requiring the closure of Grand Avenue. A larger waterway opening allows more water to pass under the bridge, so it’s expected to reduce how often the bridge and Grand Avenue are closed. An existing USACE flood protection project and closure structure located immediately to the west of the west abutment impacted bridge design. The location of the west abutment was controlled by the levee on the west end of the bridge. The width of the west end floodgate constrained the bridge width. A non-standard continuous reinforced concrete slab bridge was designed to minimize the superstructure depth, and high abutments with a vertical face were used to maximize the waterway opening. The bridge has an eight-foot-wide sidewalk on the north side of the bridge and a five-foot-wide sidewalk on the south side of the bridge. They connect to the Walnut Creek Trail, which passes under the east end of the bridge. A retaining wall was used to retain the fill and allow the trail to be near the east abutment. The retaining wall follows the trail to the north and allows it to be near an electronic billboard located northeast of the bridge. The bridge has several aesthetic features including concrete formliners and colored concrete stains, ornamental concrete bridge railings, and decorative steel pedestrian fences. The City of Des Moines requested aesthetics as a part of the project because it’s one of the more visible and frequently used city bridges. The stains and ornamental features used match other bridges in the area. Snyder & Associates performed the survey, stream hydrology and bridge hydraulic design, roadway design, and provided construction review services to review shop drawings and answer contractor questions. We performed preliminary bridge design, prepared for and attended public information meetings, final bridge design, and provided construction review services to review shop drawings, provided periodic site visits, and answered contractor questions during construction.